Sometimes I get something in my head that just won’t get out. Like a new tune on the radio (especially those of the beat up the beat variety). Or water when it gets stuck in your ear for days after swimming all day long. Like a 6-year-old. It happens. Or when you see a baked good in the background within the scene of your favorite TV show. That hasn’t happened to you? Only me? Call me crazy, but when I spotted black and white sandwich cookies on an episode of Shameless, I immediately turned to Shaun and proclaimed that I must make them.. immediately! He half indulged me, half rolled his eyes in the opposite direction, I’m sure pondering...where did I find this woman? Not to worry. I got it out of my system. It’s just the way it has to be. 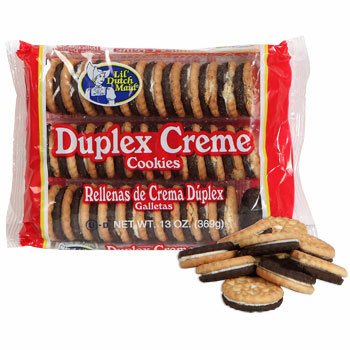 After I commenced a full-blown, four alarm search for these original, packaged cookies on the Internet so I could show you all the original version, I realized that they are more obscure than I thought. They are kind of like an Oreo...but one cookie in the sandwich is chocolate, while the other cookie is vanilla. Put some vanilla cream in the middle, dunk it in a glass of milk and I’d say we’ve got ourselves a winner. The packaged version of these cookies are not exactly the height of sophisticated eating. In fact, when I finally tracked them down, I found them at the Dollar Tree online. I don’t mind. They remind me of elementary school class parties and Girl Scouts, enjoying them alongside fruit punch (did you ever dip your cookies in fruit punch? No?...Er, me neither). Anyhoo, obviously I had to make these immediately. You should too. These were super easy, if a tad time consuming due to rolling and flattening each individual cookie. I didn’t mind. Preheat oven to 375 degrees and line 3 large baking sheets with parchment paper (my friend). In a mixing bowl, sift together the flour, cocoa powder, baking soda, and baking powder. In the bowl of a stand mixer (or with a hand mixer), cream together the butter and sugar until fluffy. Add the egg and vanilla extract and mix completely. Add the flour mixture in 3 parts, mixing until completely combined after each addition. Roll into 1 ¼” balls and place on your baking sheets. I used a large melon baller and then separated each ball in 2. Flatten with the back of a glass or measuring cup if you are like me and even though you have a kitchen full of used/dirty dishes and tools, shudder at the thought of one more measely item to wash (and by wash, I mean load into the dishwasher). Bake 10-12 minutes, rotating the baking sheets midway through the cooking time. Cool on a wire rack. Same as above, but without the cocoa powder. Make these balls slightly smaller since they expanded more while baking, causing some uneven matching between the chocolate and vanilla cookie sizes. Beat the butter and shortening together. Add the sugar, ½ cup at a time until light and fluffy and completely combined. Beat in the vanilla extract. Once the cookies are completely cooled, spread about a tablespoon of frosting on half of the cookies, and cover with the other half. 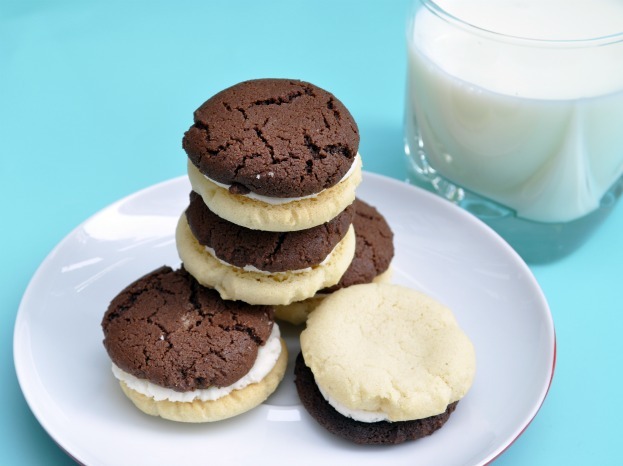 These crunchy cookies are best served dunked and softened in a cold glass of milk. Obviously. I only prepared about half of the cookies and packed up the rest in the freezer since it makes a whole lotta cookies! I also froze half the cream filling. My plan is to break these out for Easter or Shaun’s upcoming birthday. So what do you think? Do you remember any cookies or eats that bring you back to childhood? What's your favorite cookie?